Pro²Future’s Research Program is consolidating research results within two core areas, i.e. 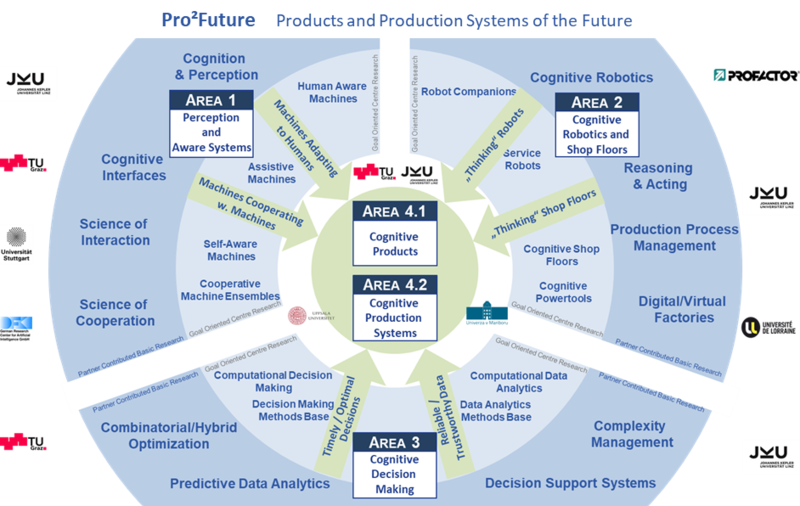 AREA 4.1 Cognitive Products and AREA 4.2 Cognitive Production Systems, underpinned with three major scientific areas, each taken from foundational and goal-oriented research disciplines related to cognitive systems, namely AREA 1 Perception and Aware Systems, AREA 2 Cognitive Robotics and Shop Floors and AREA 3 Cognitive Decision Making. The research agenda is aligned with the views of Pro²Future’s International Scientific Advisory Board (ETH Zurich, MIT Media Lab, CMU, University Stuttgart, KIT Karlsruhe, DFKI and NTU Singapore), and is embedded into the EU Research Agenda of H2020 excellence in science (ERC, FET), industrial leadership (LEIT) and societal challenges (energy, transport, materials). Moreover, Pro²Future’s research agenda and area structure as well form the basis for the Common Research Program (CRP). Within the Common Research Program, Pro²Future collaborates with the COMET Center for Digital Production located in Vienna.